Have u seen a pink beach before? wow, this is going to be very interesting. have only seen the normal white beach sand but pink, no. You might be interested in reading: what if happily ever after is moving on? horseshoe bay beach, which gets its name from its horseshoe shape, is a popular beach paradise that features a beautiful curve of light pink sand running into the beautiful blue waters of the Atlantic Ocean. It’s caused by tiny red organisms that grow beneath the coral reefs just off the shore. When they die and fall to the ocean floor, the organisms mingle with bits of coral and crushed shell that are washed onto the beach and make the sand appear an otherworldly shade of pink. Elafonisi Beach is located on the southwestern side of Crete, Greece. The islet features shallow, turquoise water with beautiful white and pink beaches. The island is a protected zone, so there is only natural beauty in every direction. It is is easily reached by foot from the mainland because the water between the two is very shallow and sometimes even non-existent. Due to the shallow, warm water, it is a popular destination for families traveling with small children. In addition to surreal, pink beaches, Elafonissi has several small caves, other sandy beaches, and intriguing rock formations that visitors can explore. Pink Beach, or Pantai Merah, as it is aptly named, and is just one of the many amazing features of Komodo Island that make it truly a Natural Wonder of Nature. This exceptional beach gets its striking color from microscopic animals called Foraminifera which produce a red pigment on the coral reefs. The place where you can find pink sand in Zamboanga is on Santa Cruz Island, Philipplines. It is quiet there, and beautiful. There are red corals in the waters around Santa Cruz island. As those red corals age and die off, they form sand that is pink. It is that simple, but it is so very beautiful. 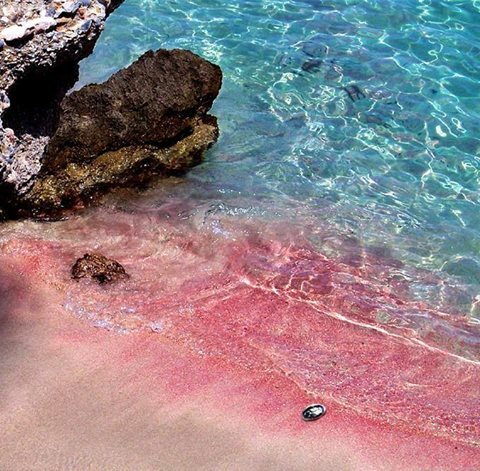 Spiaggia Rosa is one of the few places on the planet to have pink sand. As a result, it’s one of the most unique and paradisiacal spots on the Italian Mediterranean. The brilliant color of Spiaggia Rosa comes from a concoction of crushed fossils, crystals, coral, and dead marine creatures, which blend together to tint the sand with a rosy blush. Tangsi Beach or better known as Pink Beach of Lombok Island is located in Sekaroh village, Jerowaru district, East Lombok district is an attractive tourist destination and worth visiting for its uniqueness. This beach is one of seven beaches in the world that has pink beach sand, and one of two beaches in Indonesia that has pink beach sand. The pink color of the sand is formed because the original grains of white sand mix with pink coral debris. Bias sunlight and exposure to sea water adds more clearly visible pink beach color. This beach is so calm and only has a small wave that makes tourists more comfortable when playing there.